We revisited the sub-$300 category to see what had changed in this affordable market. After saying goodbye to the Lucero LC230S, we added two familiar electro-acoustics to our chart: the thinline Stagg C546TCE and the interesting Antonio Hermosa AH-50 – both well-worthy of your time! 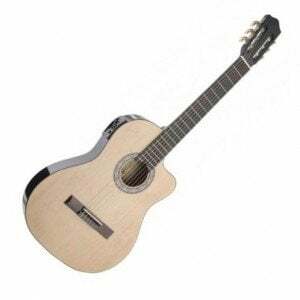 Good news – these days, having $300 in your pocket grants you access to a big market of classical guitars, many of which offer great value for money and a significant step up in terms of variety. 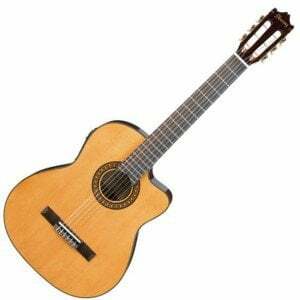 What to Look for in a Classical Guitar Under $300? You’re still quite a way from premium, but as you move out of the super-budget zone, you’ll find the materials, playability and craftsmanship all start to improve. If you are in the market for a new nylon-stringed guitar in this under $300 range, you’ve come to the right page, as we have searched high and low for a selection of the best classical guitars on offer, which we’ve highlighted below. Timeless electro-acoustic quality in an affordable package from Yamaha. A classical made and designed with the student in mind. The electric guitar giants take on the classical for today’s player. Not reinventing the classical guitar just making it affordable for everyone. Qualities and features on a superior level, easily competing with bigger names. Modern take on a classical that is ready to be plugged in. Just like Yamaha’s excellent CG102, the electro-acoustic CGX102 is an entry-level classical guitar that will impress experienced players as much as it will beginners. With a quality feel, it features a timeless look, with a non-cutaway classical body, a 25-9/16" scale length and a high-gloss finished body. This is comprised of a laminated spruce top, with laminated nato back and sides. There’s also a sleek and very playable classical mahogany neck, with a rosewood fretboard and 19 frets. The CGX102 comes fitted with a battery-powered Yamaha-designed System 68N preamp, that offers very simple controls as well as an on-board digital tuner, and amplifies the guitar’s warm, rich tone in a natural way. Check out the full specs in our full review of the AW54CE. The Iberia series by Cordoba is their line of guitars made with the student in mind. The Cordoba C3M is the full-sized and solid cedar top entry in the range. The back and sides are mahogany. The neck is nato and has a rosewood fingerboard that features a C-shape, radius of 406mm, and a two way adjustable 4mm truss rod. The “M” in its name stands for the matte finish that shows off the wood grain and allows the guitar to resonate very well. The rosette is hand inlaid wood that really pops and adds to the looks of the guitar. The tone is warm and is very responsive to how you attack the notes. Ibanez are well-known for their rock-fueled electric guitars, but they also make a great classical instrument – as this model proves.. 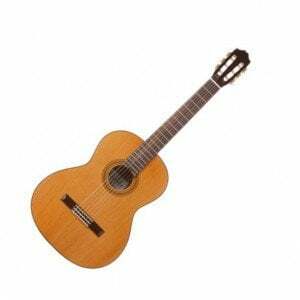 The GA6CE is a classical guitar with a spruce top and mahogany back and sides. The body also features a cutaway for easier access to all of the fingerboard. The neck is mahogany with a width of 52mm at the nut. Rosewood is used for the flat fingerboard and the bridge. The cutaway effects the projection of sound, but don’t worry Ibanez has included electronics to help with this issue. The AEQ45 preamp has a three band EQ that also includes a presence and volume controls. The tone is bright with plenty of string clarity and definition. 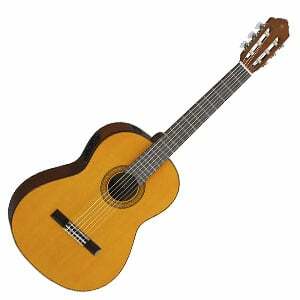 The Washburn C80S Madrid does not try to reinvent the classical guitar, but makes it affordable. It uses solid cedar for the top with rosewood back and sides. The rosette is inlaid wood and adds to the looks of the guitar. The neck is mahogany with a nut width of 52mm. The fingerboard and bridge are both made of rosewood. The compensated saddle and nut are both made of GraphTech’s Nubone. The gold plated open gear tuners are very stable and sit atop the slotted headstock. The sound is traditional and well balanced. The voice projects well with plenty of confidence. This well-crafted student model will keep you playing for years and years. Players familiar with the budget market will know the name Stagg, as the brand are usually on hand to offer a decent guitar at a super low price. As we move one step above the ‘cheap’ classical category, Stagg are still present, with their excellent C546TCE electro-acoustic, reviewed in full here. It sports a slim, 3” deep body which is very lightweight and comfortable. This body is crafted from laminated spruce on the top, with catalpa back and sides, all finished in high gloss. There’s also a catalpa neck, traditional rosewood fretboard, and 18 frets – all accessible thanks to the cutaway. For the affordable price, the EQ7545R preamp performs well, proving versatile with volume and 3-band EQ controls. Perhaps the wildcard of this sub-$300 category comes in the form of the Antonio Hermosa AH-50, which – on first glance – isn’t your traditional classical guitar. It also looks a lot more expensive than it is! With no soundhole, the AH-50 features a chambered body made of spruce on the top, with mahogany back and sides. Acoustically it’s the equivalent of an unplugged electric, so the piezo pickup is essential, while the onboard EQ allows you to tweak your tone. The mahogany neck plays as well as an electric guitar, and has a rosewood fingerboard with 22 frets. For beginners it’s great, but it will also appeal to advanced guitarists wanting something a little different. For more on the AH-50, see our full review. Whether you’re shopping in the high end or the bargain bin, the general style of classical guitars rarely changes. Now and again you’ll see something a little different, but – especially in this sub-$300 region – there won’t be too many surprises when it comes to design. If you do want something a little different, Ibanez specialize in colored guitars, so be sure to check out their GA Series. The quality of craftsmanship will be a little better in this price range too, even though the guitars will still be mass-produced and will still be made in Asia. Brands including Cordoba, Lucero, Yamaha, Washburn, and the aforementioned Ibanez all dominate this price range, and the majority of their models tend to impress. As for materials, there’s nothing too different to what you would find in the budget range, with familiar woods such as cedar, spruce and mahogany all well-represented, while you will also see a couple of more exotic woods such as bubinga used on back and sides (Lucero’s LC230S is a fine example of this wood in action). In this price range, you find more use of solid woods for tops, although laminates will still be the norm for back and sides. This mix leads to a guitar with better tone and bigger projection. On the topic of projection, one thing you see more of as you move up into the $200-$300 category is electro-acoustic classical guitars, which allow you to plug the guitar into an amplifier and… well, amplify your sound. The prime question you need to ask yourself is: do I need an electro-acoustic? If you are planning to plug into an amp to play on stage, be it solo, with a group or an orchestra, then an electro-acoustic is a great idea. The same goes for recording. It’s the most convenient way to amplify your sound – instead of having to mike up the guitar – and allows you to shape your tone directly from the guitar. The fact that many preamps come with built-in tuners is another plus. However, unless you are planning to record or perform – and especially if you are a beginner – we suggest going for a plain acoustic model. You tend to get more guitar for your money buying this way, because you aren’t paying for the electronics. So, a $300 classical guitar will probably be better quality and smoother to play than a $300 classical that’s loaded with electronics (in theory at least). If you have your heart set on an electro-acoustic, don’t let us deter you – you can find some excellent models in this sub-$300 category. As you’ve seen, it’s not difficult to find a quality, highly playable classical guitar with a good sound in this sub-$300 price range. It’s quite simple in fact! The five classical guitars we’ve highlighted are not a comprehensive list, but go a long way in giving you a snapshot of the best guitars on the market for your money – whether plain acoustic or something with electronics. Whatever you choose, make sure to read reviews and watch videos of the guitars on your shortlist before you buy. Do your research and find something that fits, and then enjoy the guitar!